Is Dennis Skinner the real face of the Labour Party? No, of course he isn't. But the fact that all parties contain a broad spectrum of opinion did not stop Labour List yesterday from strongly implying that the fact that a few MPs on the extreme right of the Tory party have published an Alternative Queen's Speech must somehow mean that those few are "the real face of the Tory party". I think we can solve this one quite quickly by just totting up how many of those are official Conservative Party policy. Liam Byrne has come out in favour of a minority Labour government if there is a hung parliament where Labour are the largest party after the 2015 general election. His view is that he thinks a minority Labour administration could achieve more than a coalition and also that the current government has "given coalitions a bad name". In some ways this view is unsurprising. In the political memory of almost everyone in the contemporary PLP (at least in the Commons) they have never had to share power. Their experiences in government between 1997 and 2010 were of sole stewardship of the levers of government and it is hardly surprising that elements within would want to repeat that, even if the electorate did not want to give them a majority. But there is an implicit assumption built into this idea from Byrne. For a minority government to have any stability it would require minor parties (likely including the Lib Dems) to be willing to agree a "Confidence and Supply" arrangement with Labour. This would mean them promising to support Labour in any confidence motion and also to allow budgets to pass. I have previously detailed my views on confidence and supply explaining how I think it would give all of the downsides of a coalition but without many of the benefits. This would apply just as much in a potential arrangement with Labour as it would with the Conservatives. I do not think my views on this are unusual. There are plenty in my own party who feel similarly, indeed that is one of the main reasons that the 2010 coalition went ahead as the alternatives were all worse in the views of the key negotiators. 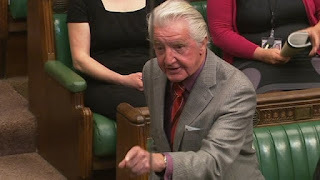 So if Byrne's view prevails within Labour and they as the largest party in a hung parliament try to go for a minority government that is predicated on some pretty big assumptions about how smaller parties will fall into line and provide the day to day support needed to even perform the basic functions of a government. It is far from clear that would be forthcoming and it is somewhat arrogant in my view for Byrne to simply assume that it would and that somehow it would mean Labour could achieve more than it could in a coalition. In fact this is the same arrogance that Adonis betrayed in his book "5 Days in May" (that I reviewed here) where he and other senior Labour figures were convinced a coalition with the Lib Dems could work despite the maths not favouring such an arrangement based on a series of assumptions about how all the other parties would back them. To an extent I can understand Byrne's wish to find a "better way" to govern were there to be a hung parliament. There is no denying that coalition has been tough and from the outside looking in to Labour politicians I can see why they might balk at such an arrangement themselves. But the idea that a minority government would be better strikes me as tribalistic and short-sighted. Any minority government is unlikely to last more than a year or two and parties who show they are unwilling to work with others may well find they are punished at the ballot box at least as much if not more than those who are willing to take the risk of going into coalitions. My membership renewal for the Lib Dems came through this morning. It marks five years since I first joined the party. This anniversary has reminded me of something I have been meaning to write about for a while. The continuum on which political activists of all parties sit. Regular readers will know that I do a weekly podcast with an old friend of mine Emma Burnell who is a Labour activist. Emma joined Labour back when she was a teenager and has spent the last 20+ years campaigning for them and being a highly active member involved with all sorts of internal organisations over the years. She is happy to describe herself as a "tribalist" and whilst I have some quibbles with her over the exact definition of that word I agree that even by my stricter interpretation of its meaning, she is one! Emma has made it clear that pretty much no matter what the Labour party did she would stick with them and if she was unhappy try to change the party from inside. As far as it is possible to be she is "Labour till she dies". Another friend of mine, Caron Lindsay is a very long-standing member of my own party the Lib Dems. Like Emma, Caron has been involved with the party from a very young age and has been on various internal committees and held various positions within it. Also like Emma, Caron has made it clear that she is also in this party for the long haul. She is to all intents and purposes "Lib Dem till she dies". Which brings us to me. Although I am of a similar generation to Emma and Caron and am probably obsessed with politics to a similar extent (and have been since I was a child) I chose not to get involved with a specific party until 2008. And I think this matters. I do not have as much vested within my chosen party. Whilst I know quite a few people within the Lib Dems fairly well they are all somewhat recent acquaintances. My long-standing friendships are all with people who are outside my party and in most cases politics altogether. So my roots do not go anywhere near as deep. There are certainly scenarios I could imagine that could lead to me leaving the party. In fact I actually came pretty damn close earlier this year when the secret courts legislation was passed by my party in government in direct opposition to what the members of the party wanted. In the end I restricted myself to pledging to refuse to campaign for any Lib Dem MP who voted for the measure. But I had several dark nights of the soul and it could have gone the other way. So despite being in different parties from each other, Emma and Caron probably have much more in common with each other as political activists than either of them do with me. I think there is a continuum at work here. I am quite close to one end of it - very interested in politics and in a party but without a deep seated rooting within it and my friends are close to the other end of it - so heavily invested in their parties that they cannot really imagine ever leaving it. I think parties need those of us who would consider leaving, performing a similar service to the floating voters in the wider electorate reminding party hierarchies that they cannot take their membership for granted. Maybe if I stick around then by 2023 or 2033 I will be the sort of "cut me and I bleed yellow" activist that form the core of activists for political parties but I am certainly not there yet. But I have renewed my membership for another year. That gets me another year closer to perhaps eventually being one! Cast your mind back to last year when the Lords Reform bill was working its way through parliament. Like many Lib Dems I was delighted that finally, after so many years we were going to get a largely elected upper chamber. Then the murmurings started. Tory backbenchers were going to kill the bill and they did indeed eventually vote against it in sufficient numbers to prevent it from being implemented. The consequence of this is that we still have a bizarre and anachronistic unelected upper chamber with no prospect of change any time soon. The primary defence of the Tories who voted against the bill was that all that was in the coalition agreement on this subject were plans to "bring forward proposals" and they had honoured that. In their view they were never duty bound to support them. I always thought that was terribly disingenuous. As John Rentoul pointed out at the time, what would be the point of proposing to bring forward proposals if they were then just going to be put in the bin? Fast forward to today when Nick Clegg has killed Liz Truss's childcare proposals. His defence of this move is that the agreement was only to "consult" on these changes, not to implement them. Sound familiar? I'm not saying this is a great situation for the government to be in but you have to ask yourself which of the parties was the first to breach good faith in this way? Episode 61 of the House of Comments podcast "Total Recall" was recorded yesterday and is out today. This week in a slightly shorter episode than normal myself and Emma Burnell discuss the latest parliamentary scandal and ask whether we need a clampdown on lobbying and also the ability for MPs to be recalled as well as Labour's latest announcement on means testing pensioner benefits.